Salomon’s first tech binding, the MTN. If you think it looks an awful lot like the Atomic Backland, that’s because it is. The companies are related, meaning you can ensure proper color coordination on your setup with identical functionality. If you look good, you feel good. If you feel good, your skiing will likely be just as good. The MTN binding is light, fully featured, and fool-proof (no fools were harmed in our testing). The toe piece features a large, sturdy lever that’s easy to manipulate with frozen hands or thick gloves. A wide mounting pattern improves power transfer on wide skis, so you can confidently use the same binding on your mountaineering skis and your powder skis. A retractable toe guide makes it easier than ever to step into the binding, but disappears once your boot is in so technical skin tracks are a breeze. The unique heel-piece features a “semi-adjustable” release value. The MTN binding includes three separate release value fork assemblies that can easily be swapped. Notably the spring swap changes both the lateral and forward release values, creating one of the lightest bindings with adjustment for release and boot sole length. The springs assemblies are labeled “Women, Men, and Expert,” noting there are many women of the Wasatch and beyond that can humbly ski harder than the Women's spring would safely allow. 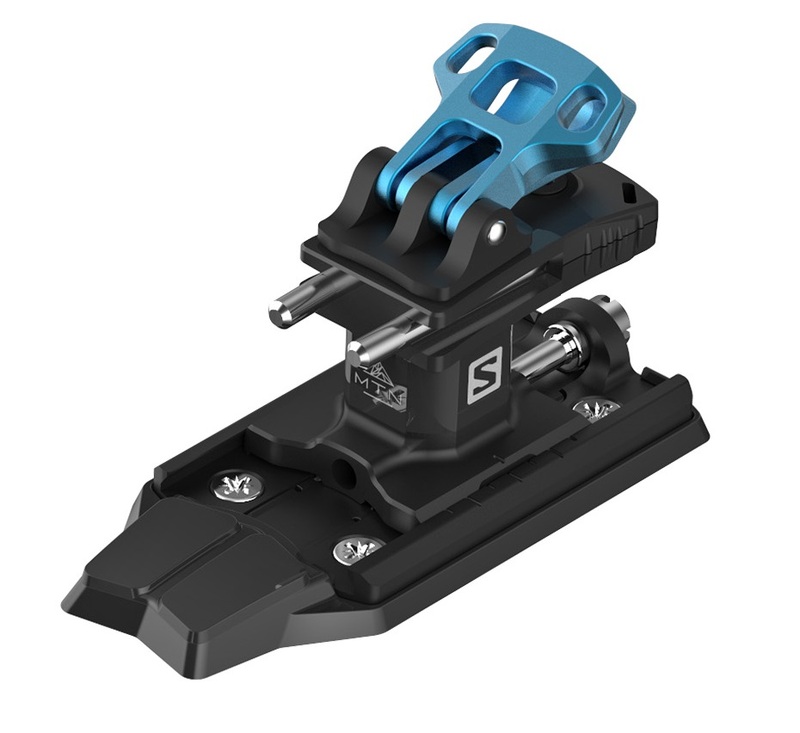 The heel housing sits on top of a stout baseplate with 30mm of fore-aft adjustment built in. On the roof are two risers strategically machined to keep weight to a minimum and durability to a maximum. 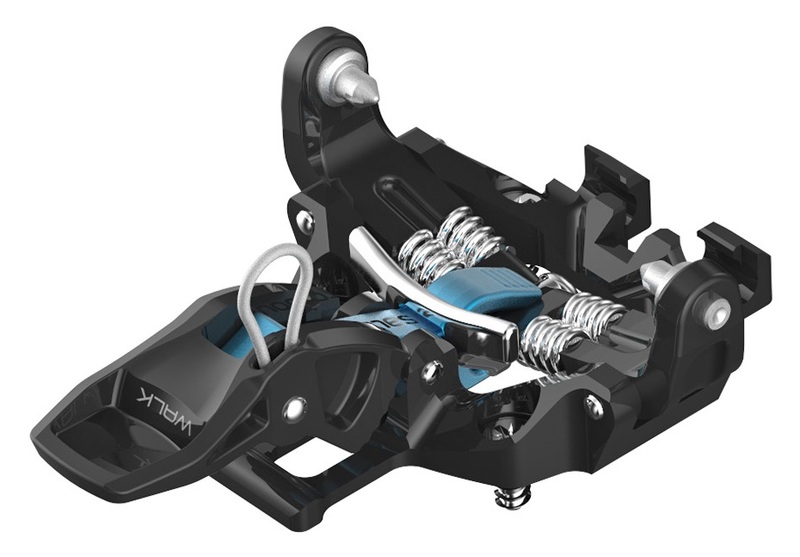 Twist the heel housing 90° and you get a flat mode which makes long approaches much easier. 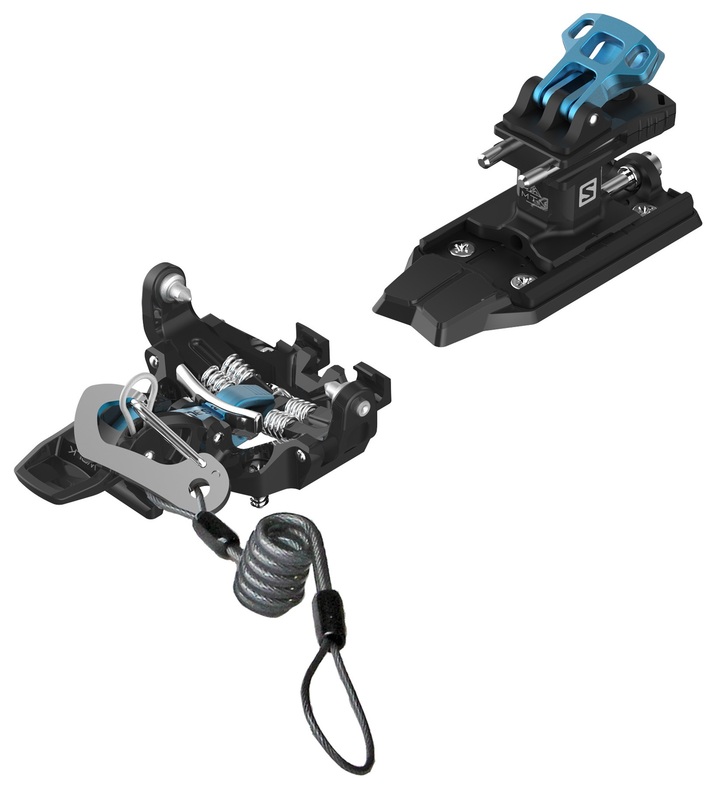 The Salomon MTN binding is one of the most user-friendly tech bindings we have seen. A mere 592g per pair, the MTN binding is as light as it is burly. Included leash can be used to set the heel gap at home or in the field. Women’s, Men’s, and Expert springs included for customizable release values. Two risers plus a flat mode adapt to the oncoming terrain. Wide mounting platform for high-speed stability and power transfer. I have the Kreuszspitze GT with quiver killers which I have been super impressed with. They are my goto binding for any big day or multi day trips. I just bought some Blizzard ZG 108s which I'm going to use for day tours and side country w/ some in-bounds thrown in and am thinking I might want something slightly beefier with dedicated ski brakes for that set up. Looking at the Atomic/Solomon MTN bindings or maybe the Plum Guide. Plum is slightly heavier and my Dynafit crampons won't work (right?) but they look like they are built super well and its an established design. Atomic/Solomon look good on paper but the issues mentioned with the riser tabs are a concern to me. What are your thoughts on these options...or any others you think would be a good match...or should I just get another set of quiver killers and save $600!? Hi Brent, these Atomic/Salomon bindings have been absolutely excellent performers. Given the number that we have sold, I'm thoroughly impressed by them and I have seen them used very very hard. I personally have not seen any come back for warranty and the comment about the heel flaps is the first I've heard. I would go for it. The odds are that you will be super happy with these bindings. These seem like great bindings to begin with. Widely available, relatively light, and adjustable. They inspire confidence unlike many other UL bindings, one feels solidly attached to their skis. However after moderate use the heel riser flaps begin to flip up and down at random with the skinning motion. Think the old Ion and Speed Radical twist while skinning. Will you sell just a pair of the Salomon MTN (or Atomic similar...) HEELS? (Not toes). I’m trying to ‘save’ a pair of recently mounted skis (w Superlights) w a heel that’s easier to use. This is for an intermediate female skier who is not a hard charger). Thanks for your continued awesome service. Hey Richard! It's entirely possible, though not on the table at the moment. I am keeping my fingers crossed for individual availability of toes and heels in the near future as the toes are amazing in their own way and the heels are amazing in their own way as well, so it'd be fun to use them as a franken-binding. It sounds like you already know where to look for toes and heels individually, so I won't bother you there, but for anybody else that's reading this, you can find toes and heels separately here. However the heel lifters/riser assembly came loose. It is attached with a hex screw, but the only way I could figure out how to access it was to unmount the binding from the ski. Did I miss something? In order to get to the screw, you have to back the adjustment screw out all the way, and slide the heel tower off the mounting plate - which seemed impossible while still on the ski. Hi Shane, that's an interesting issue. We haven't seen it here in the shop so I'm not certain how to go about fixing it, but from looking at the binding I believe you have taken the correct action. Do these come with all 3 springs for release value? Hi Will, yes, they come with all 3 springs. I'm trying to decide between the ATK Haute Route 2.0 and these. The ATK's are much lighter on paper. However, not being able to get my hands on a pair of the ATK's and not finding any videos online, I'm not sure if you can turn the heel piece to get to a position where you can access the flat, ~36, and 50mm modes. Does anybody have any insight? Thanks! Hi Kyle, we do not sell the ATK HR 2.0 so any info I provide you on that binding is purely speculation, but I believe it does have a flat mode. One thing to keep in mind that if you are based in the U.S. that there won't be any warranty support for ATK branded bindings as they do not sell in the U.S. market. Hey John! They don't release laterally from the toe in the way that you are probably thinking. The lateral release initiates from the heel piece rotating and the toe piece follows suit. Release value is more along the lines as these bindings don't meet the "DIN" certification but it is adjusted via the varying U-Springs that come with the binding. I'm wondering if the mount hole pattern on these is different enough from the ATK Haute Route 2.0 to remove the ATK's and go with these at the 0 mount position? The ATK's are my first foray into superlite and they are that and built incredibly well but I'm not a fan of rotating the heel piece for flat and high riser mode. The old stick your hand in powder and slide your pack into your head over and over isn't ideal. Hi Dillon, it looks like a close call, but on paper it looks like you will be able to mount this binding without interference from your old holes. Thanks for pointing that out Eric. Very cool to see the French companies collaborating. Do you know the approximate DIN/RV of the women's, men's, and expert U springs? Hey Michael, sorry for the slow reply! For liability's sake we're going to forego publishing them on the website. There's almost definitely one that'll match up with your desired release value, but I'm going to answer your question with another question: What release value are you looking for? Hey Michael, thanks for the response! Men's spring would likely suffice, noting there is a relatively high standard deviation on the springs so it might be worth getting tested. The Expert spring would be stiffer and the women's spring is much too soft. Brakes will change things as well. what is the delta on these? Hi Steve, the heel pins are +8.5m above the toe pins. More details here (same as Atomic Backland).